The Grow Smarter Strategy on-line. In 2014, the City of St. Pete and the St. Pete Chamber of Commerce together hired Market Street Services, Inc to build a strategy for growing St. Pete’s economic position. The Grow Smarter Strategy targets specific job sectors for growth and development. In these “targets”, competitive advantages exist, prospects for future growth are greatest, and return on investment is likely highest. Grow Smarter builds initiatives that support these seven strategic focus areas. The Grow Smarter Strategy targets these 5 job sectors for growth in St. Pete. The strategy outlines specific focus areas, goals, and actions for St. Pete’s economic future. Grow Smarter is a partnership between the City of St. Petersburg & The St. Pete Chamber of Commerce. It is an economic development project who purpose is to assess and enhance St. Petersburg’s competitive positioning for quality, diverse economic growth. The Grow Smarter project began in 2014, when the 10-month assessment stage took place, gathering quantitative and qualitative data from St. Petersburg residents and diverse community stakeholders through focus groups, surveys, and other reliable data sources. The Grow Smarter Strategy compares St. Petersburg against other regional cities of similar size and economic prospect. In many cases, the Tampa Metro Area is used as a marker, and St. Petersburg is compared to county, state, and national trends. Reputable and reliable private, non-profit, local, state, and national government data sources were leveraged, with every effort made to match methodologies and units of comparison across sources to provide the most accurate and informative analysis of St. Petersburg’s demographic trends, economic structure, and sense of place. This report synthesized reputable quantitative data along with qualitative data from stakeholder interviews and a public survey to frame a picture of St. Pete as a place to live, work, visit, do business. Rather than simply describing data trends, the Competitive Assessment synthesizes key findings from the analysis and community input framing the discussion around key “stories” and competitive issues faced by the community. St. Petersburg trends are then compared against the cities of Durham, North Carolina; Jacksonville, Florida; and Orlando, Florida. Using the findings from the first phase, the Target Business Analysis evaluated the city’s workforce, existing economic strengths, global trends, and both obvious and “aspirational” job sectors. These target job sectors help city leaders understand the make-up and potential growth areas of St. Petersburg’s economy. The goal of the Target Business Analysis was to identify how to diversify and strengthen the economy through entrepreneurship, existing business expansion, and recruitment. Numerous strategies to foster and expand growth in these target sectors are outlined in the Grow Smarter Strategy section. During this phase, a Marketing Analysis was performed, it reviewed of principal marketing programs and tools of various stakeholders in St. Pete including the city of St. Pete and the Chamber of Commerce, as well as regional entities. 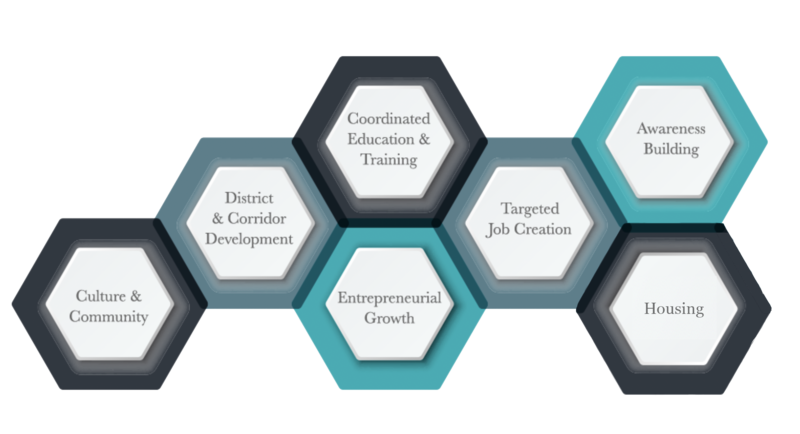 The culmination of phases 1-3, this stage outlines proposed goals, strategies, and actions to generate economic growth and prosperity. This Strategy is holistic and inclusive of the many components that affect St. Petersburg’s ability to be a prosperous community. The following actions were determined by the Grow Smarter Steering Committee through group discussion and participation on an online comment survey. They represent the most impactful, priority activities that the Grow Smarter implementation team should focus on during the initial months after strategic launch. If the Strategy is the “what,” the Implemention is the “how.” This phase lays out the structure of the implementation of goals, initiatives, and strategies. The Implementation Plan will serve as the road map for putting the Strategy into motion. It outlines the activities of the Strategy’s objectives on a day-by-day, month-by-month, and year-by-year basis. Specifically, it lays out the organizational structure, prioritizes proposed actions, and designates working groups for each strategy.